Another major channel for distributing alerts could be emerging. Remember when the TV industry first converted to digital HDTV? Well, there’s a new version of digital TV developing in the U.S. that could open interesting possibilities for alerting. Standards are being developed for Mobile DTV (Digital TV), which would allow broadcasters to provide new services to handheld devices. Alerting is on the table. 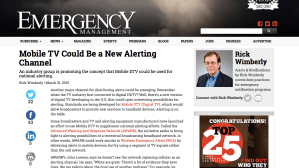 Some broadcasters and TV and alerting equipment manufacturers have launched an effort to use Mobile DTV to supplement national alerting efforts. Called the Advanced Warning and Response Network (AWARN), the initiative seeks to bring light to alerting possibilities of a terrestrial broadcasting broadband network. In other words, AWARN could work similar to Wireless Emergency Alerts (WEA) by delivering alerts to mobile devices, but by using a segment of TV signals rather than the cell network. AWARN’s John Lawson says he doesn’t see the network replacing cellular as an alerting channel. He says, “WEAs are great. There’s a lot of evidence they save lives. We are talking about the dual use of another pathway.” For example, he says AWARN would mitigate the challenge of a 90-character limit on WEA messages. While the cellular industry seems to be open to increasing the number of characters, it appears to remain concerned about what URLs would do to the load on the cellular networks. Lawson says AWARN doesn’t have these types of limits. In fact, he says AWARN could address many of the shortcomings of WEA pointed out by a recent study for the U.S. Department of Homeland Security. The National Consortium for the Study of Terrorism and Responses to Terrorism at the University of Maryland offered convincing evidence that 90 characters is not sufficient to guide people to take corrective action, although acknowledged the messages get people’s attention. The study suggested that messages be longer and include URLs and digital maps. Lawson said AWARN could overcome all of those challenges. Lawson also says that AWARN could “help reinvent the historic relationship between broadcasters and public safety.” He’d like to see public safety organizations team with local broadcasters for demonstration projects and pilots. Locals would benefit, and groundwork would be laid for national deployment. Although it’s being tested in a few places, AWARN won’t be ready nationally until Mobile TV is. Industry must finalize standards. Broadcasters must upgrade their equipment. Mobile device makers would need to make modifications. Regulators would have to approve. The National Association of Broadcasters tells the Mobile DTV story through its site, The Future of TV. It won’t be quick process, but broadcasters are highly motivated as they work to keep themselves relevant. This could be a big deal for alerting; a nice supplement to existing alerting channels with a motivated TV and broadcast industry behind it. Certainly, the value to Mobile TV becomes clearer as important public safety uses become more obvious. It’s time for some forward-leaning folks to help make this a reality. Watch soon for a post on a similar alerting opportunity using radio station signals and car dashboards.